Figure 3.2: A. Analysis of mRNA expression in peritoneal macrophages (PM) revealed increased expression of TNF-α in PM from wild type (WT) as compared to MPO-deficient (Mpo-/-) mice. n=4/5. B. Bone marrow derived macrophages (BMDMs) from Mpo-/- mice were treated with MPO for 24 h. Treated cells showed a significantly higher expression of mRNA for inducible NO-synthase (iNOS), TNF-α and Interleukin (IL)-6 and for arginase as compared to untreated cells. n=4/5. C. Peritoneal lavage was performed in Mpo-/- mice 3 days after i.p. injection of NaCl, MPO or thioglycolate (Thio). Quantification of leukocytes in lavage fluid revealed increased number upon MPO and thioglycolate treatment as compared to control. n=15/16/14 D. The percentage of macrophages from peritoneal cells as described in (C) was increased in MPO and thiogycolate treated animals as assessed by flow cytometry. E. Immunohistochemical quantification of macrophages in myocardial sections of WT and Mpo-/- mice after 3 days of myocardial ischemia disclosed reduced macrophage accumulation in Mpo-/- mice. n=4/3. Current concepts for the treatment of heart failure (HF) center around augmenting cardiac contractility. However, progression of HF is critically propagated by dys-function of resistance vessels, thereby impairing coronary perfusion and yielding increased peripheral vascular tone. Inflammation is recognized as a key factor in vascular dysfunction, with macrophages being a major component of vessel wall infiltrates. There is accumulating evidence that – apart from macrophages – activation of polymorphonuclear neutrophils (PMN) also importantly contributes to vascular dysfunction. However, little is known about the interplay of macrophages and PMN in this context as well as about their mechanistic role in the regulation of vascular resistance. The PMN- and macrophage-derived heme enzyme myeloperoxidase (MPO), which catalyzes the generation of reactive pro-inflammatory species, emerges as an important mediator of inflammatory vascular diseases. Given that MPO release is increased in HF patients, that MPO promotes activation and recruitment of leukocytes, and that the enzyme via nitric oxide (NO)-scavening is causally linked to endothelial dysfunction, the current project intends to investi-gate the significance of MPO-induced macrophage activation for vascular dysfunction in HF. In a mouse model of dilated cardiomyopathy (DCM) using muscle LIM protein-deficient (MLP-/-) mice, we found that concomitant MPO-deficiency attenuates the increase in systemic vascular resistance (SVR). This was accompanied by improved systolic left ventricular function. Notably, MLP-/- mice exhibited enhanced microvascular MPO deposition as compared to wild type (WT) littermates. 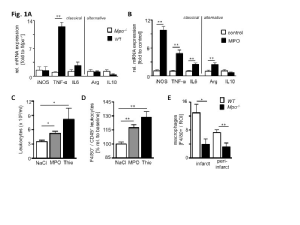 Recent findings have revealed that MPO activates macrophages leading to production of pro-inflammatory cytokines and expression of inducible NO-synthase, as detected in peritoneal macrophages from WT vs. MPO-deficient (Mpo-/-) mice and in MPO-treated bone-marrow derived macrophages (Figure 3.2 A,B). Thus, MPO appears to promote classical macrophage polarization, thereby causing a pro-inflammatory macrophage phenotype. Furthermore, MPO was found to contribute to macrophage recruitment as disclosed upon peritoneal MPO injection and in a model of myocardial ischemia using WT and Mpo-/- mice (Figure 3.2 C-E). First, we will further characterize the underlying molecular and cellular mechanisms of MPO-mediated macrophage activation and polarization in vitro utilizing peritoneal and bone marrow derived macrophages from WT and Mpo-/- mice as well as the cell line THP-1. The cells will be treated with MPO, MPO-derived reactive species, and inactive MPO variants either alone or in combination with factors inducing classical or alternative polarization (IFN-γ, IL-1β, IL-4). QRT PCR and immunoblotting will be performed to investigate the phenotypic subtype (expression of iNOS, TNF-α, IL-6, IL-12, IL-23, MCP-1, CCR2, arginase, IL-10, TGF-β) and the intracellular signaling (Nf-κB activation, signal transducer, and activator of transcription (STAT)-pathway, Krüppel-like factor (KLF), and peroxisome proliferator-activated receptor (PPAR)γ expression). Second, in vivo studies will use WT littermates, MLP-/- mice, Mpo-/- mice, and MLP x MPO double-knockout (MLPxMpo DKO) mice to investigate mechanisms underlying the low-grade chronic vascular inflammation reflected by microvascular MPO deposition and increased SVR. Importantly, enhanced pro-inflammatory polarization and retention of macrophages, that leads to the amplification and prolongation of inflammation, results from a disturbed resolution of inflammation. Thus, monocyte recruitment will be investigated by intravital microscopy in cremaster muscle and mesenteric microcirculation and the macrophage phenotype will be characterized via immunostaining in cremaster muscle whole mount and hind limb muscle preparations and flow cytometry of mesentery single cell suspensions. Of note, enhanced PMN infiltration and delayed PMN apoptosis are key factors of disturbed inflammatory resolution mechanisms. Both processes have been previously linked to MPO: In detail, leukocyte recruitment is initiated by MPO interaction with the endothelial glycocalyx. Neutrophil apoptosis is substantially delayed via MPO-binding to CD11b/CD18 integrins, which was linked to prolonged inflammation in a lung injury model. Thus, PMN recruitment and apoptosis will be investigated via intravital microscopy and flow cytometry. Third, to characterize the causal relationship of macrophages and the HF phenotype, WT, MLP-/-, Mpo-/- and MLPxMpo DKO mice will undergo monocyte/ macrophage depletion by repeated intravenous injection of liposome-encapsulated clodronate (35 µg/g BW). In another cohort, recruitment of activated monocytes will be inhibited by intravenous injection of siRNA targeting CCR2. Furthermore, clodronate- and siCCR2-treated or control MLPxMpo DKO mice will receive chronic MPO infusion via the jugular vein using osmotic mini-pumps (0.05 ng/g/min). Inflammation of vascular endothelium will be characterized by immunohistochemistry in myocardial and hind limb muscle sections and cremaster muscle whole mount preparations and microvascular MPO deposition will be quantified. Endothelial function will be assessed ex vivo (isometric force measurements) and in vivo (determination of SVR), and the severity of HF will be evaluated in vivo by assessing the pressure volume relationship of the left ventricle. Collectively, this project will decipher the mechanistic role of macrophage polarization as a stress response pathway in HF. The significance of MPO as a modulator of the macrophage´s phenotype and as a central disruptive factor for the resolution of inflammation will be explored. Ultimately, results from this project will help to better understand the potential of MPO as a novel therapeutic target in HF. Given the potential proinflammatory, macrophage activating properties of MPO, MPO inhibition, which is in early preclinical development, may alter vascular function by modulating the activation state of macrophages. This project will enable us to identify the cytokine-like properties of MPO and to potentially characterize novel pathways of and redundancies in macrophage polarization reaching from diabetes to atherosclerosis. Thus, this project will interconnect research interests of this group with the expertise of the Pasparakis and Brüning groups, both of whom have broad research experience with respect to macrophage polarization and inflammation. Immunohistochemical analysis of macrophages and PMN will be performed by the histopathological core facility (A. Quaas / R. Büttner) and vascular MPO distribution will be analyzed by the molecular imaging core facility (B. Neumaier). Chronic kidney disease (CKD) is an increasingly prevalent condition and associated with cardiovascular morbidity and mortality. Microvascular dysfunction of the glomerular circulation is of major importance in the pathogenesis of CKD, as the majority of kidney diseases start in the glomerular microcirculation of the kidney filter. Loss of podocytes, pericyte-like cells of the glomerular capillaries, is now being viewed as the culprit of progressive glomerular disease as postmitotic podocytes display a very limited capacity of self-renewal. Research over the past decade has revealed that activation of pathogenic pathways in podocytes is both sufficient and required for the development of progressive glomerular disease and damage to the glomerular microcirculation. Recently, we showed that intrinsic stress signaling pathways and overshooting inflammatory signaling in podocytes promote glomerular disease. Furthermore, inhibition of podocyte inflammatory signaling by podocyte-specific gene deletion of the NF-kB essential modulator (NEMO, IKBKG) gene alleviated glomerular inflammatory disease and prevented dysfunction of the glomerular microcirculation. We also used advanced mass spectrometry based proteomics technologies to show that inflammatory changes of the podocyte are associated with profound changes in proteostasis mechanisms involving the ubiquitin-proteasome system as well as proteolytic processing through intracellular proteases. In this project, we will now further define the underlying molecular and cellular mechanisms that may contribute to progressive damage of the glomerular microvasculature due to inflammatory signaling in podocytes. The major aim is to develop a profound understanding of the signaling mechanisms and consequences on protein homeostasis in podocytes to develop options to resolve intracellular stress damage. Specifically, we will (1) identify the targets of proinflammatory signaling in cleavage of cytoskeletal and slit diaphragm proteins, (2) assess the contribution of stress signaling in podocyte cell detachment from the underlying basement membrane resulting in denudation of capillaries, and (3) study the contribution of various stress signaling pathways to podocyte apoptosis, necrosis, and detachment using advanced live-imaging technologies. In collaboration with the Pasparakis and Brüning groups, we have already generated various knockout and knockin mice models that allow for the modulation of activity of p38, NEMO, JNK, AKT, ERK1/2, and p53, among others, in podocytes as well as established various knock-in and knock-out models for imaging and genetic analyses using CRISPR/Cas genome engineering technologies. An overarching aim of this study is to identify the underlying molecular mechanisms of injury that are amenable to potential therapeutic inter-ventions to combat the increasingly prevalent progressive CKD. It is expected that interventions that target the inflammatory and stress signaling process per se will provide a promising new approach to attack a large group of overlapping disorders through an innovative intervention. This project assimilates well into the framework of the proposed graduate program since it will unravel novel mechanistic insights into podocyte and microvascular dysfunction at the interface of the kidney filtration barrier. Further extension of existing collaborations with the groups of J. Brüning (mouse models, metabolism, posttranslational modifications), M. Pasparakis (mouse models, ER stress, cell death), S. Rosenkranz (signal transduction, kinase networking), and B. Schumacher (stress signaling) will enable us to identify unifying pathogenic principles of stress-induced vasculopathies using the latest mouse models and state-of-the-art technology. In addition, utilization of technology provided by the core facilities will be beneficial to this project: RNAScope and Nanostring (Histopathology; A. Quaas / R. Büttner), mass spectrometry based proteomics (C. Frese / M. Krüger), and sequencing (Functional Genomics; P. Nürnberg). Of note, all our mouse models are also available to all other groups within this consortium. Finally, we predict that the conserved mechanisms of vascular damage through attack on pericyte-like cells of the vascular system may also be applicable to other organs. Figure 3.3: SILAC based chemoproteomic screen reveals CERS5 and CERS6-derived sphingolipid binding-proteins. (A) Experimental design of proteomic screen to identify specifically CERS5- and CERS6-derived sphingolipid interacting-proteins. Theoretical MS1 SILAC spectra that indicate the loss of sphingolipid/protein interaction in CERS5- or CERS6- deficient cells. SILAC channel color code: light: green, medium: orange, heavy: red. (B) Volcano plot showing the log2 fold change of SGPL1Δ (- UV) versus SGPL1Δ (+ UV) against the –log10 p value of a one-sided t-test. Significance was considered for Benjamini-Hochberg corrected P-values < 0.05 and log2 fold change > 0.58. Proteins that are annotated by ‘ceramide’ in the GOBP (Biological Process) term are annotated by red color. (C) Volcano plot of log2 fold change of CERS6Δ/SGPL1Δ (+ UV) versus CERS5Δ/SGPL1Δ (+) UV against the –log10 P-value of a two-sided t-test. FDR < 0.05 and log2 fold change > 0.58 was used as the significance cut off. Ceramides have been classically viewed as a homogeneous group of sphingolipids that have also been linked to metabolic and vascular disease, respectively. However, ectopic accumulation of ceramides has evolved a major risk factor for the development of obesity-associated insulin resistance and has been also linked to vascular inflammatory disease such as atherosclerosis. Interestingly, C16-containing ceramides, whose synthesis is specifically catalyzed by ceramide synthase enzymes (CerS)-5 and -6, play a pivotal role in the development of metabolic disorders. We demonstrated that by specifically reducing CerS6-derived C16 ceramides protection against obesity and obesity associated insulin resistance is conferred (Turpin et al., Cell Metab. 2014). However and in striking contrast ablation of CerS5-dependent C16 ceramide formation fails to protect from the adverse metabolic consequences of high fat diet-induced obesity (Hammerschmidt et al., under revision). We also revealed that CerS5- and CerS6-dependently generated C16-ceramides differentially localize to the ER and mitochondria, respectively (Hammerschmidt et al., under revision). In order to test, whether CerS5- or CerS6-dependently formed C16 ceramides according to their distinct subcellular localization might also interact with distinct effector proteins, we performed immunoprecipitations with photoactivatable ceramide precursors, which were incubated in control cells, CerS5-deficient, as well as CerS6-deficient cell lines. 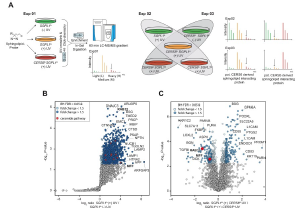 Through the comparative analyses of ceramide-interacting partners as identified by SILAC-based quantitative mass-spectrometry approaches, we indeed successfully identified proteins that specifically interact with C16 ceramides dependent on whether they were generated by CerS5 or CerS6 (Figure 3.3). Strikingly, CerS6-dependently-formed C16 ceramides specifically interact with the mitochondrial fission factor (Mff), a key regulator of mitochondrial dynamics and function. Collectively, we have defined a novel effector mechanism, how distinct acyl-chain lengths ceramides dependent on the subcellular localisation of their specific synthetizing enzymes determines specific metabolic functions. In the proposed study, we aim to delineate the specific underlying molecular and cellular mechanisms through which CerS6-derived C16-ceramides promote atherosclerotic lesion formation. To this end, we will identify the subcellular localization of CerS5- and CerS6-dependently generated C16 ceramides in endothelial cells and atherosclerotic plaque using LDLR-/- mice. Finally, we will study the specific contribution of the thereby identified signaling network(s) in control of lipid-induced ER-stress activation in endothelial and smooth muscle cells – key events during dysregulated stress signaling in vascular dysfunction and functionally validate the contribution of CerS6-dependently formed C16 ceramides in the progression of atherosclerosis through analysis of conventional as well as myeloid lineage, vascular smooth muscle as well as endothelial-specific CerS6-deficient mice. Collectively, these experiments will unravel novel molecular effector networks and pathways of critical importance for the pathogenesis of atherosclerosis associated with obesity. This project will further promote the development of specific CerS6 inhibitors, which may have the potential to emerge as pharmacological tools to treat vascular inflammatory diseases such as atherosclerosis. The project ideally integrates into the framework of the proposed graduate program since it aims to unravel a novel regulatory principle of stress-response alterations in metabolism and vascular dysfunction. Close collaborations with the Trifunovic and Pasparakis groups will allow us to actively pursue studies on mitochondrial dynamics as well as interactions. Moreover, the core facility of mass spectrometry based proteomics will be utilized (C. Frese / M. Krüger). Ultimately, this research project will allow us to define the link between C16-ceramide-induced dysregulation of ER-stress and the activation of inflammatory signaling cascades. In addition, the analysis of atheroclerosis progression in the different CerS6-deficient mouse models will be pursued in close collaboration with the group of S. Rosenkranz. Figure 3.4: Nuclear localization of MPO in ECs. 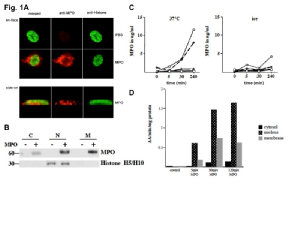 A. HUVECs were incubated with MPO (red) for 2 h, which localized in cytoplasmic and nuclear foci; nuclei were visualized using an anti-histone antibody (green). B. Cultured rat heart ECs were incubated with MPO and nuclear (N), cytoplasmic (C) or mitochondrial lysates (M) were immuno-blotted. C. HUVECs incubated on ice or at 37°C with MPO were queried for MPO translocation into nuclei over time; nuclear (diamonds), membrane (circles), cytosolic (squares), and cytoskeletal fractions (triangles) are shown. D. MPO enzymatic activity was assessed spectrophotometrically in fractionated HUVECs. MPO is a known inflammatory mediator severely affecting vascular and myocardial function. MPO is secreted by activated neutrophils and monocytes, accumulates in the plasma, and is taken up by endothelial cells (ECs) in the microenvironment. This leads to the remodeling of EC gene expression both in vitro and in vivo. Yet, how this is achieved remains unknown. We offer preliminary evidence in support of the hypothesis that MPO function is a result of its translocation into cell nuclei where, given its predicted capacity to bind chromatin, it may modulate transcription. If this holds true, MPO will constitute a unique example of cell-to-cell crosstalk via a secreted enzyme directly acting to regulate gene expression. We propose probing the molecular function of MPO in ECs, using a combination of cutting-edge genomics and cell biology technologies, along with animal models. Such an approach should expand our current understanding of MPO’s impact on vascular inflammation and will help to establish MPO-directed specific pharmacological therapies in cardiovascular disease. We and others have identified MPO as associated with various cardiovascular disorders and causally linked to atherosclerosis, heart failure, and arrhythmia. ECs actively take up MPO via trans-cytosis (Baldus et al., JCI 2001) and MPO induces (amongst others) expression of the endothelin receptor type-B (Lau et al., JMCC 2014). MPO deficiency suppresses adenosine receptor A3 expression in ECs of a diabetes murine model (Nishat et al., JCP 2014). We performed proof-of-principle experiments validating MPO translocation into EC nuclei within 2 hours (Figure 3.4). Moreover, analysis of MPO’s primary and tertiary structure revealed an overall negative charge, focused on long arginine/lysine-rich stretches reminiscent of “AT-hook” DNA binding motifs. Finally, because we now know that AT-hook factors are difficult to capture on chromatin, we tested a dual-fixation protocol at suboptimal temperature, allowing us to obtain rich chromatin-binding profiles. Thus, all necessary preliminary data and tools are in place to support the spatio-temporal characterization of the nuclear role of MPO. The key aim of this project is to investigate the role of MPO in EC nuclei at high spatiotemporal resolution. First, to provide imaging of MPO translocation dynamics, we will use confocal microscopy and a high-resolution time-course (0-6 h in 30 min intervals) to follow the translocation of MPO in EC nuclei in vitro. This approach will define the time-point of maximal MPO titers used in all subsequent experiments (as well as entry, exit, and retention times). Next, we will use super-resolution imaging (a gSTED in-house platform) to colocalize nuclear MPO with hallmarks of active (H3K4me3, H3K27ac) or inactive chromatin (H3K9me2, H3K27me3), as well as with nuclear hallmarks (Lamin B1, nuclear pore components, nucleolar markers). This will provide a detailed subnuclear localization of MPO. Finally, we will use EC fractionation into cytoplasm, nucleoplasm, chromatin, and “transcription factories” to orthogonally verify the results from super-resolution colocalizations. Second, we will assess MPO chromatin-binding and transcriptome remodeling. Here, we will use genomics to identify MPO chromatin binding preferences (ChIP-seq) and EC expression profile remodeling (RNA-seq) at the time-points specified above. We will apply our dual-fixation protocol on ECs treated with MPO to stabilize its (direct or indirect) chromatin association, before pulling-down MPO-bound complexes using a highly-specific monoclonal antibody (MAB3174, R&D). Massively parallel DNA sequencing of these complexes and computational analysis of the data in comparison to “background” data from untreated ECs will reveal its binding positions. These positions can then be further analyzed in comparison to available genome-wide histone modification and transcription factor binding data (from the Papantonis lab or the ENCODE project). In parallel, RNA from control and MPO-treated ECs will be sequenced to obtain complete transcriptomes of the two conditions, using “spiked-in” libraries (as per ERCC instructions), so as to normalize data. Curated up-/down-regulated gene lists will reveal the pathways and functions affected by MPO. Finally, integrating ChIP-seq and RNA-seq data will allow us to identify direct MPO targets. Third, we will evaluate MPO and chromatin organization and provide in vivo validation. Here, we will dissect MPO function at the molecular level by pulling-down MPO from EC nuclear extracts and subjecting protein complexes to proteomics. In combination with label-free quantitative analysis this will return putative MPO interactors, which can be validated by knocking-down selected ones and checking the extent to which they affect MPO association with chromatin (by ChIP-qPCR) and gene expression (by RT-qPCR). Second, we will also apply targeted Chromosome Conformation Capture (3C) technology to uncover the interaction between MPO-bound sites and gene promoters in three-dimensional nuclear space. This approach relies on designing capture probes for all MPO binding sites genome-wide, and using them to subselect spatial chromatin interactions from untreated and MPO-treated ECs. Following massively parallel sequencing, we will be able to get bona fide physical connections between MPO-bound sites and the promoters of genes the enzyme regulates. Of note, this approach will also be invaluable if MPO binding sites are found to be mostly intergenic. Another advantage is that such 3C-based data will allow us to further filter the lists of direct MPO targets identified earlier on in this project. Finally, in vitro results from ECs will be validated in vivo: For this purpose, we will test animal models of kidney dysfunction (Benzing), atherosclerosis (Brüning, Pasparakis), pulmonary hypertension (Rosenkranz) and mitochondrial dysfunction (Trifunovic) for enhanced MPO secretion in plasma and consequent expression of MPO-downstream targets in mesenteric tissue and cremaster muscle (comprising microcirculatory vessels) via immunostaining and immunoblotting. Microvascular function will be tested in vivo with and without pharmacological MPO inhibition in these models, given that enhanced expression of MPO targets is detectable (systemic vascular resistance, blood flow velocity, neutrophil and monocyte recruitment, endothelial permeability). Finally, patient specimens, such as explanted LIMA tissue from patients undergoing coronary artery bypass grafting, will be directly investigated at the single-cell level for changes in response to MPO. The identification and mechanistic validation of direct MPO targets will add valuable information that will help us to establish pharmacological inhibition of the MPO regulatory pathway as a specific therapeutic strategy in cardiovascular disease. The collaboration formed here bridges clinical (Baldus) with basic research (Papantonis). The interdisciplinary approach is key to the success of this project, since the clinical model system will be investigated using cutting-edge genomics, thereby enabling – for the first time – the study of inter-cell transcriptome remodeling via the signal transducer itself. Once downstream MPO targets are identified, appropriate mouse models for atherosclerosis, PH, CKD and mitochondrial dysfunction will be provided by CCRC groups (Baldus, Pasparakis, Rosenkranz) to assess the pathophysiological relevance of MPO-regulated molecules (see above). Furthermore, this project will benefit from the core facilities for sequencing (Functional Genomics; P. Nürnberg) and proteomics (C. Frese / M. Krüger). Figure 3.5. Schematic depiction of the pathways and key molecules regulating apoptosis and necroptosis downstream of death receptors and Toll-like receptors. Atherosclerosis remains the number one cause for morbidity and mortality in western countries. The development and growth of atherosclerotic plaques is the result of a chronic non-resolving inflammatory response involving the activation of endothelial cells to express cytokines, chemokines, and adhesion molecules, thereby resulting in the recruitment and entrapment of monocytes in the subendothelial space. Here, monocytes mature into macrophages that take up lipids to become foam cells. The death of lipid-laden macrophages is believed to critically affect the progression of atherosclerosis. The aim of this project is to experimentally address the role of apoptosis and necroptosis in atherogenesis. Apoptosis of foam cells within the atherosclerotic plaque, combined with impaired efferocytosis resulting in secondary necrosis has been recognized as an important process fueling inflammation. While apoptosis has been studied since many years and was until recently believed to be the only pathway of regulated cell death, recent research has revealed the existence of regulated necrotic cell death pathways that are controlled by distinct biochemical signaling cascades. Necroptosis is a type of regulated necrotic cell death that is induced by the kinase RIPK3 and its substrate pseudokinase MLKL. 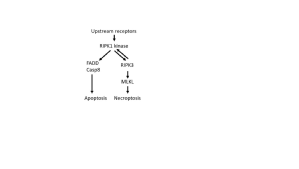 RIPK1 is an upstream kinase that has an important role in inducing both FADD-Caspase-8-dependent apoptosis and RIPK3-MLKL-dependent necroptosis (Figure 3.5). Recent studies have suggested that RIPK3-dependent necroptosis of macrophages contributes to the growth and progression of atherosclerotic plaques in mice. However, since RIPK3 can also induce apoptosis and in addition exhibits cell death-independent proinflammatory functions, the role of necroptosis in atherosclerosis remains poorly understood. To experimentally evaluate the role of apoptosis and necroptosis in atherogenesis, we will use genetic mouse models to inhibit specifically necroptosis (MLKL knockout) or both apoptosis and necroptosis (FADD-RIPK3 double knockout) to address the in vivo role of macrophage death in the development and progression of atherosclerotic plaques. In addition, we will also use mice expressing a kinase inactive mutant RIPK1D138N to determine the role of RIPK1 kinase activity mediated cell death in the development and progression of atherosclerotic plaques. For these studies, we will use bone marrow reconstitution in the LDLR knockout mouse model of atherosclerosis. Specifically, 8-week-old LDLR knockout mice will be lethally irradiated (1000 Rad) and will be reconstituted with intravenous injection of bone marrow cells obtained from the different genetic mouse models (RIPK1D138N, Mlkl-/-, Ripk3-/-, FADDMy-KO Ripk3-/- mice). The bone marrow reconstituted mice will be treated with broad spectrum antibiotics in the drinking water for 4 weeks until efficient reconstitution of their hematopoietic system is confirmed by FACS analysis of blood cells. Subsequently, the mice will be fed a high cholesterol diet for 10 weeks to promote the development of atherosclerotic plaques. The levels of cholesterol and triglycerides in the serum of the mice will be assessed before and after the high cholesterol diet feeding. At the and of the 10 week high cholesterol feeding period, the development and progression of atherosclerosis in these mice will be assessed using methodologies that are well established in our lab. Specifically, the aortas of the mice will be dissected and used for en face staining of lipids with Sudan IV followed by morphometric analysis and quantification of plaque formation. Aortic arches will be dissected and will be used for RNA preparation and subsequent qRT-PCR analysis of proinflammatory cytokine and chemokine as well as adhesion molecule expression. The hearts of the high cholesterol diet-fed mice will be dissected and frozen in OCT and consecutive 7 μm cryosections of the heart in the atrioventricular valve region will be collected and stained with toluidine blue, followed by morphometric analysis of atherosclerotic plaque size. Sections will also be immunostained for macrophages as well as for dead cells (apoptotic, necroptotic). Collectively, these studies will provide novel insights into the underlying molecular and cellular mechanisms by which inflammatory and cell death signaling downstream of death and toll-like receptors regulate the progression of atherosclerosis. This project bears the potential to identify targetable proteins as important contributors to the progression of atherosclerotic plaques. Specifically, our studies aiming to address the role of RIPK1 kinase activity in the pathogenesis of atherosclerosis may identify RIPK1 as a therapeutic target in this disease. Considering that RIPK1 inhibitors are currently in phase II clinical trials for the treatment of different inflammatory diseases, our studies have strong therapeutic potential. Here, we assess the functional contribution of apoptotic and necroptotic cell death in vascular pathology using mouse models of atherosclerosis. Given the focus on monocytes and macrophages, other groups focusing on this cell species (Rosenkranz, Rudolph, Baldus) will benefit from close collaboration with our group. Since RIP kinase and TLR are redox sensitive, other enzyme systems expressed in monocytes and macrophages are also attractive to study, e.g. MPO (Baldus) or pharmacological interventions such as nitrated fatty acids (Rudolph). Core facilities will help to visualize and quantify plaque morphology and composition (histopathology; A. Quaas / R. Büttner), and to perform proteomics-based analyses (C. Freese / M. Krüger). Additionally, in vivo imaging of cell death may be facilitated by molecular imaging (B. Neumaier). Figure 3.6 (A) Inhibition of the catalytic class IA PI3K isoform p110 by PIK75 reversed pulmonary vascular remodeling and PH in the Sugen/Hypoxia model of PH. (B) Role of IL-6 and IL4-R for macrophage M2-polarization and its expected role in PH (modified from Mauer et al. Nat Immunol 2014). Loss of the protective six-transmembrane protein STAMP-2 in macrophages was associated with increased IL-6 expression (C) and perivascular accumulation of CD68-positive cells (D) in the pulmonary vasculature under hypoxic conditions. Pulmonary hypertension (PH) is a devastating vascular disease characterized by a high mortality and limited treatment options. In addition to adverse regulation of vascular tone and remodeling, inflammation is increasingly recognized as a key pathogenic factor. However, the precise inflammatory mechanisms and their specific contribution to the pathobiology of PH remain elusive. In this project, we aim to evaluate the pathogenic relevance of interleukin (IL)-dependent macrophage and T-cell activation for vascular dysfunction in PH. Preliminary work has shown that selective interference with specific targets such as the catalytic PI3K isoform p110a is capable of preventing or even reversing PH and pulmonary vascular remodeling in rodent models (Figure 3.6 A). Among the inflammatory cytokines found in PH is IL-6, but its role in regulating immune responses remains a matter of scientific debate. Recently, critical roles in the regulation of macrophage polarization as well as T-lymphocyte function with respect to the manifestation of innate and adaptive immune responses have been defined. More specifically, abrogation of IL-6 signaling in myeloid lineage cells resulted in increased expression of proinflammatory M1-macrophage marker genes, while activation of alternative M2-polarization was reduced. Furthermore, IL-6 was shown to upregulate IL-4 receptor expression in macrophages, and loss of macrophage IL-6 signaling prevented IL-4-mediated M2-polarization and its beneficial metabolic effects (Figure 3.6 B). With regards to inflammatory resolution, loss of the protective six-transmembrane protein STAMP-2 in macrophages, which is downregulated in human PH, was associated with pulmonary upregulation of IL-6 and perivascular accumulation of CD68-positive cells under hypoxic conditions (Figure 3.6 C,D). Collectively, these findings assign IL-6 signaling a critical role in alternative macrophage polarization, thus impacting inflammation, and potentially vascular remodeling and PH. The aim of this project is to define the role of macrophage- (and T cell-, 2nd term) intrinsic IL-6 signaling and to assess their impact on IL-4-mediated signals and macrophage polarization in pulmonary vascular remodeling and PH. To this end, we will use already available genetic mouse models to selectively prevent IL-6 signaling in macrophages (IL6Ra-Δmyel) (Mauer et al. Nat Immunol 2014) or T cells (IL-6RaT-KO) (Xu et al. Nat Commun 2017). Furthermore, we will explore the role of IL-4 by utilizing IL-4Ra knockout mice. In the first term, we will focus on myeloid cells, whereas T-cell function will be investigated in the second term. To systematically define the role of myeloid IL-6 and IL-4 in the context of PH, we will (1) compare macrophage polarization and PH phenotypes in WT vs. IL6Ra-Δmyel mice; (2) analyze the function of IL-4R signaling in PH by comparing WT vs. IL-4Ra-/- mice; (3) characterize the role of IL-4R in IL-6-induced PH by comparing WT vs. transgenic IL6-Tg(+) vs. IL6-Tg(+)//IL-4Ra-/- mice; (4) analyze the effects of an anti-IL6R mAb as a treatment approach on macrophage polarization in Su/Hx-induced PH. Phenotypical characterization will include monitoring of body weight, body composition, energy expenditure, and glucose homeostasis. PH in mice will be induced by the established hypoxia model, and the degree of pulmonary vascular remodeling (aSMA and vWF double staining, morphometric analysis), PH (RV pressure as assessed by Millar® right heart catheter), and right ventricular hypertrophy (RV/LV+Septum ratio) will be compared among the genotypes. For the mAb treatment approach, the Sugen/Hypoxia (Su/Hx) model in the rat will be used. Mechanistically, we will assess the composition of remodeled vessels and the infiltration of inflammatory cells and macrophage polarization into pulmonary vascular lesions and hypertrophied RV via histology as well as gene expression analyses, cytokine / chemokine profiles (e.g., IL-1β, IL-4, IL-6, TNF-α, TGF-β, IL-10, IL-12, IL-4R, Arg1, iNOS, FGF, PDGF, CCL3, CCL5, CX3CL1), both in situ and in purified cells from pulmonary arteries in vitro. These studies will be complemented by analysis of ligand-stimulated signal relay in relevant cell types, such as ECs, vascular smooth muscle cells, and perivascular fibroblasts. Finally, alterations of IL-6/IL-4 signaling and the contribution of inflammatory cells will be monitored in other mammalian species including Sugen/hypoxia-induced PH in rat models and in PH patients. Collectively, these experiments will provide novel mechanistic insights into the inflammation-related pathobiology of pulmonary vascular disease and will allow us to define the cell-type-specific role of IL-6 signaling in the onset and progression of PH in vivo. We anticipate that this study may potentially provide the molecular basis for novel, disease-modifying pharmacological interventions. Immune-modulatory therapies represent an exciting opportunity to further improve the treatment options of this deadly disease. This project will ideally integrate research expertise in metabolism and inflammatory IL signaling (Brüning) into the clinical context of PH (Rosenkranz). Since the project also aims to unravel the key steps involved in immune response regulation leading to pulmonary vascular pathology, close collaborations with S. Baldus (hemodynamics), A. Trifunovic (mitochondrial function), and M. Pasparakis (macrophage biology, ER stress, cell death) will enable us to better define specific aspects of inflammation-triggered stress-responses in PH. This project will also benefit from the core facilities for histopathology (A. Quaas/R. Büttner), mass spectrometry based proteomics (C. Freese / M. Krüger), and potentially from molecular imaging (B. Neumaier). Vascular inflammation and depletion of nitric oxide (NO) with ensuing microvascular dysfunction is critical in HF with preserved ejection fraction (HFPEF) [1,2]. Nitrated fatty acids (NO2-FA) are endogenously occurring termination products of inflammatory, oxidant-induced nitration reactions. By reversible electrophilic adduction to biological targets via their NO2-group, these molecules increase vascular NO, and resolve inflammation. Previously, our group has demonstrated protective effects of NO2-FA in myocardial ischemia/reperfusion  and angiotensin II-(ang II) induced atrial fibrotic remodeling . Given the central role of vascular inflammation and impaired NO signaling in HFPEF, we aim to unravel the role of NO2-FA in this disorder. In preliminary studies, the effects of NO2-FA on C57BL/6J mice exposed to a continuous subcutaneous infusion of Ang II (1000 mg/kg/min) in addition to a salt diet (1% NaCl) for a period of 28 days (AS-treatment) were investigated. Compared to untreated animals, AS-treated mice revealed a significant increase in normalized heart weight, as well as pronounced evidence of cardiomyocyte hypertrophy and interstitial fibrosis. Additional treatment with OA-NO2 (1nmol/(g*h)) via subcutaneous osmotic mini-pumps lead to the suppression of left ventricular hypertrophy and diastolic dysfunction upon echocardiographic examination (Figure 3.7). To further characterize diastolic dysfunction, mice will be investigated by in vivo conductance-catheter-based pressure-volume loop analyses. Apart from pertinent parameters of diastolic function, special attention will be paid to effective arterial elastance (Ea) and arterial-ventricular coupling (EES/Ea) to determine the contributions of systemic vascular effects of OA-NO2 on the observed ventricular changes. In addition, systemic endothelial dysfunction will be investigated by determination of systemic vascular resistance as well as acetylcholine-dependent relaxation of aortic rings. eNOS expression, phosphorylation, dimerization, and uncoupling will be assessed in cardiac and aortic tissues along with protein nitro-tyrosination and quantification of NO metabolites. As coronary endothelial dysfunction has been described as a contributor to the pathophysiology of diastolic dysfunction  cardiac endothelial dysfunction will be assessed by measurement of acetylcholine-dependent coronary perfusion pressure in Langendorff hearts after in vivo pretreatment as described above. In addition, since recent data have demonstrated highly efficient in vivo synthesis of NO2-FA upon dietary supplementation with conjugated linoleic acid (cLA), mice exposed to ang II and salt loading will be kept on a diet high in a racemic mixture of (9Z,11E)-cLA and (10E,12Z)-cLA and nitrite, which have been identified as the most efficient naturally substrate for in vivo NO2-FA formation. Vascular function as well cardiac reverse remodeling will be assessed in relation to plasma levels of nitrated conjugated linoleic acids as determined by liquid chromatography/mass spectrometry. Given the potent anti-inflammatory and anti-fibrotic effects of nitroalkenes, administration of the purified compound as well as dietary supplementation might evolve as attractive therapeutic options for cardiovascular disorders like HFpEF. Of note is that nitrated conjugated linoleic acid is currently being tested in phase 1 clinical studies. Given the potent anti-inflammatory properties of these molecules, further characterization of additional 'pleiotropic' effects with regard to macrophage polarization (Brüning, Pasparakis, Baldus), NFkB activation (Benzing), or pulmonary vascular remodeling (Rosenkranz) will facilitate close interaction with other groups from this consortium. Moreover, the fact that both NO2-FA and ceramides (Brüning) are membrane-derived lipids with potent effects on vascular signaling pathways offers exciting perspectives for characterizing these molecules in states of vascular stress. This project will be linked to core facilities histopathology (A. Quaas / R. Büttner) and molecular imaging (B. Neumaier). Figure 3.8: In C. elegans, persistent CpG-rich DNA induces an innate immune response that, when chronic, causes loss of proteostasis in the endoplasmic reticulum. This dysfunction ultimately leads to tissue degeneration, similar to the outcomes of chronic inflammation in higher organisms. Treatment with low doses of tunicamycin and N-acetylglucosamine (box – Therapeutic Interventions), both of which promote proteostasis, alleviate the stress on the endoplasmic reticulum leading to tissue maintenance – even during the ongoing immune response. DNA damage accumulation causally contributes to the functional decline associated with aging. Congenital defects in nucleotide excision repair (NER) lead to highly skin cancer prone Xeroderma pigmentosum (XP) or accelerated aging in Cockayne syndrome (CS) patients when global-genome (GG-) NER or transcription-coupled (TC-) NER is affected, respectively (Edifizi & Schumacher, 2015). CS patients display growth retardation and premature aging, and typically die between the ages of 12 and 16 from atherosclerosis. A better understanding of the pathomechanisms triggering such premature functional deterioration has been severely impeded by the vast complexity of NER syndromes in humans and the respective mammalian models. Therefore, to advance our current rudimentary understanding of the underlying molecular and cellular mechanisms of DNA damage-driven atherosclerosis, and potentially, other vascular pathologies, we have established the genetically traceable nematode C. elegans as a model system reflecting the distinct outcomes of NER mutations (Lans et al, 2010; Mueller et al, 2014). Importantly, we have previously determined that CS mouse models show inflammatory signaling reminiscent of natural aging (Schumacher et al, 2008). Inflammatory responses to DNA damage have been increasingly recognized as important patho-mechanisms of tissue damage, resulting from DNA damage accumulation in premature and normal aging. We have also determined that similar to mammals, DNA damage in C. elegans triggers innate immune responses and uncovered that these responses orchestrate systemic adaptations to genome instability (Ermolaeva et al, 2013). Given the strong link between NER defects and premature aging, the prevalence of atherosclerosis in CS patients, and the inflammatory signature in (premature) aging mouse models, we propose that better understanding the underlying mechanisms through which DNA damage leads to inflammation will provide new insights into future therapeutic strategies to combat vascular pathologies. To this end, we will employ C. elegans to ascertain how innate immune signaling is activated upon the presence of DNA damage. We will specifically investigate MAPK signaling pathways as evolutionary conserved immune signaling activators. We have recently uncovered how innate immune signaling leads to an inflammation-like phenotype in C. elegans that is reminiscent of tissue damage observed in mammals (Williams and Schumacher, unpublished). We will now determine how chronic DNA damage in NER-deficient nematodes triggers tissue degeneration and will assess the role of innate immune signaling by employing available genetic mutants in MAPK signaling components that allow us to genetically activate and inactive innate immune signaling. We recently determined that the inflammation-like tissue degeneration upon chronic innate immune activation leads to protein folding stress in the endoplasmic reticulum (ER), likely due to the chronic production of secreted innate immune peptides that are produced in the ER before they are passaged through the Golgi apparatus for secretion. The chronic innate immunity fails to induce the ER unfolded protein response (UPRER). 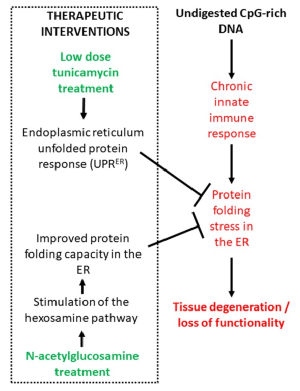 In contrast, when we apply low dose tunicamycin that induces the UPRER or treat the animals with hexosamine that leads to augmented ER protein folding activity (Denzel et al, 2014), we could systemically alleviate the inflammation-associated tissue disruption. We propose that UPRER activation could resolve inflammation-associated protein folding stress and thus antagonize the detrimental consequences of chronic inflammation. We will determine the mechanistic links between innate immune activity and ER stress by genetic analysis following of UPRER and the production of innate immune peptides upon DNA damage as well as upon cytosolic detection of CpG-rich DNA that we established to trigger an innate immune response in C. elegans. Within the consortium, we will validate whether low dose tunicamycin or hexosamine treatment might resolve the chronic inflammation associated with mammalian vascular disease models. We will systematically test hypotheses and validate our findings in mammalian disease models, thus directly benefitting from the synergisms of this consortium, to explore functional conservation of innate immune responses to DNA damage and assess their role in vascular remodeling. Our project will open new opportunities for therapeutic targeting of DNA damage driven inflammatory signaling with the aim to prevent aging-associated vascular dysfunction. This project will provide further profound insights into the fundamental mechanisms of inflammatory responses that are driven by the gradual accumulation of DNA damage with aging. Given the nuclear affinity of leukocyte peroxidases and DNA damage by reactive oxygen species, the current project will link the research projects of the Papantonis (nuclear translocation) and Baldus (MPO) groups. We will test the connection between DNA damage signaling and glomeruli dysfunction together with the Benzing group and validate links to inflammatory signaling with the Pasparakis group. Together with the Rosenkranz group, we will investigate DNA damage signaling in macrophages and during inflammation and with the Rudolph group we will assess MAPK signaling in inflammatory responses. Proteomics of the DNA damage response and genomics for detecting innate immune gene expression will be performed with the core facilities (C. Freese / M. Krüger and P. Nürnberg). PhD / MD students will gain access to model system genetics and their relevance for understanding the biology of aging-associated inflammation. 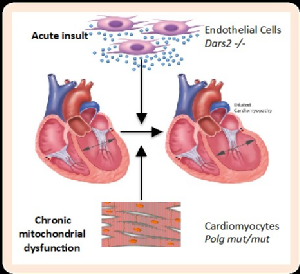 Figure 3.9: Model of endothelial cell Dars2-deficiency and experimental approach to assess the role of mitochondrial dysfunction in heart failure. Endothelial cell (EC) dysfunction crucially contributes to the development of impaired coronary and systemic perfusion as well as reduced exercise capacity in patients with HF. The key determinants in endothelial dysfunction are reduced levels of NO and abundant formation of ROS within the vascular wall. Recent studies have suggested that endothelial mitochondria are centrally involved in maintaining the fine regulatory balance between mitochondrial calcium concentration, ROS production, and NO availability. In comparison with other cell types with higher energy requirements, mitochondria content in ECs is modest, making up only 2-6% of total cell volume. The low content of mitochondria indicates that they are likely to serve as critical signaling organelles in the endothelium. The role of mitochondria in vascular smooth muscle cells (VSMCs) is even less understood. Similar to ECs, mitochondria contribute only modestly to the VSMC bioenergetics. Nevertheless, mitochondrial dysfunction, and particularly mitochondrial DNA damage, has recently been associated to atherosclerosis. The historical view that in atherosclerosis, aberrant proliferation of VSMCs promotes plaque formation, but that VSMCs in advanced plaques are beneficial by, e.g. preventing rupture of the fibrous cap, has recently also been challenged. This project aims to determine the role of endothelial mitochondria in the development of HF. To this end, we have recently developed an EC-specific model of mitochondrial dysfunction where we have abolished mitochondrial protein synthesis by deleting the DARS2 gene (Mitochondrial Aspartyl-tRNA synthase) specifically in ECs by using the EC-specific, tamoxifen-inducible Cre-line (EndSCL-CreERT). Thus, we can now precisely time the blockage of mitochondrial respiration and vary the level of damage we induce (Figure 3.9). In this project, we will analyze the hearts of Dars2loxP/loxP;+/EndSCL-CreERT mice in normal conditions and after ischemia/reperfusion injury. The analysis will include in vivo analysis of cardiac functional parameters utilizing echocardiography and magnetic resonance imaging combined with different histological, immune-histochemical, and enzymatic stainings on heart cross-sections, as well as analysis of markers of cardiac hypertrophy, mitochondrial dysfunction, and adaptive stress response. To further understand the role of endothelial mitochondria in the development of HF during aging, we will use mtDNA mutator mice – the mouse model for mitochondrial dysfunction-induced premature aging. We have previously shown that these mice develop heart hypertrophy over time. Using a mtDNA mutator mice background, we will now block mitochondrial EC function in a similar way as proposed earlier (with EndSCL-CreERT), and then follow the development of cardiac phenotypes over time. We will also mirror these proposed experiments using Dars2loxP/loxP;+/EndSCL-CreERT mice. The analysis of these mouse models will allow us to precisely determine the role of EC mitochondrial function in HF and its progression with age. Strong mitochondrial dilated cardiomyopathy and diminished respiration can be alleviated by the loss of mitochondrial matrix protease CLPP, opening a new avenue for novel therapeutic intervention in mitochondrial diseases. This project is intimately related to other projects of this initiative and will benefit greatly from collaborations with the groups of V. Rudolph and S. Rosenkranz, which will allow us to pursue the experiments of ischemia/reperfusion and systemic vascular dysfunction as well as to analyze cardiac function in vivo. This project critically depends on the services provided by Proteomics (C. Freese / M. Krüger) and Histopathology (A. Quaas / R. Büttner) core facilities and, in the future, we also anticipate the need for services from the Functional Genomics core facility (P. Nürnberg). We will also collaborate with J. Brüning and S. Rosenkranz on their respective projects providing expertise in analysis of mitochondrial dysfunction.